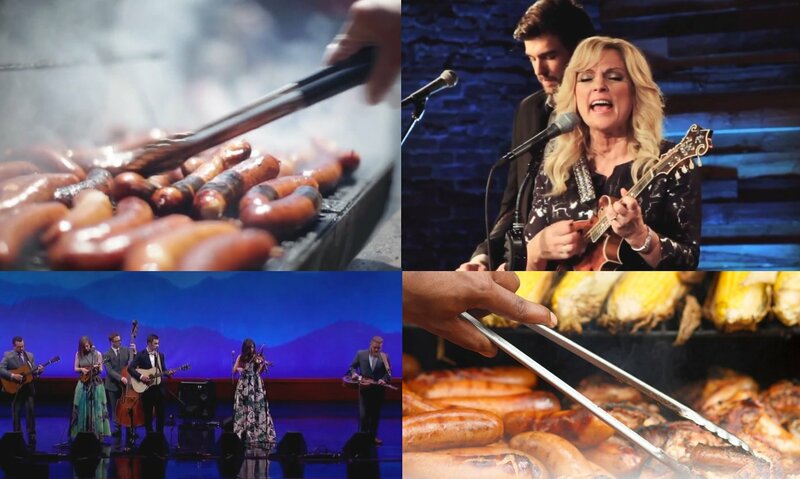 You’ll have a hot time in the summertime when visiting Tennessee and that’s because the Smoky Mountains are “smokin’ hot” for two weeks starting in late May with the savory flavors of barbeque and the sizzling sounds of bluegrass at the Dollywood theme park. For two weeks, it’s all aboard for visitors on a nonstop ride to food, fun, and fabulous entertainment – Tennessee style – at the annual Dollywood Barbeque and Bluegrass Festival. Once you enter the park, your sense of smell will come alive as the pungent aromas of sweetness and spices, grilling and smoking waft through the air. If you aren’t hungry when you arrive, it won’t take you long to become ravenous. Visual and fragrant samples of southern barbeque beckon as you pass by the many food venues. Take your pick from Miss Lilian’s BBQ Corner, the Front Porch Cafe, Hickory House, Big Skillet, Red’s Diner, and Market Square Booths. Each one has flavorful menus featuring its own version of barbeque specialties and select sauces to please any barbeque lover’s palate, along with all the traditional fixin’s to complete the meal. Slather your favorite sauce – whether you prefer rich and sweet or with a touch of tangy vinegar – over a slab of ribs, an order of BBQ chicken wings, a mouthwatering pulled-pork sandwich, or a helping of deep-smoked sausage. Add a side or two from traditional favorites such as creamy mustard-based potato salad, crisp and buttery grilled corn on the cob, beans baked in their own special sauce, and a choice of delicious desserts. Tennessee’s history is rooted deep in the Appalachian culture, which is home to bluegrass music. A blend of Scottish, Irish, English, and African cultures, bluegrass music is a sound like no other with banjos, fiddles, and guitars creating toe-tapping instrumentals, gospel, and songs with heartfelt lyrics. The lineup of performers is always stellar with some of the best bluegrass musicians to be found making their way to Dollywood for the annual music fest. Dollywood is a great venue for musicians, with multiple stages. No matter where you are, you’ll hear the twang of the banjos as performers take the stage each day of the festival at one of the many locations, so you’ll never miss a beat. Performances are scheduled at the Celebrity Theater, the Showstreet Palace Theater, Valley Theater, and the WDVX stage at the Backporch Theater. There will also be music at the Plaza at Wilderness Pass Stage, as well as bluegrass musicians roving the park to tickle your fancy with a lively tune. Enjoy as many free concerts as you like, they’re all included with admission to the theme park. From the time you enter the park, there’s no end to the fun and excitement until you call it a day. While satisfying taste buds and enjoying bluegrass at its best, plan some time to explore the theme park and its many activities. Over 40 rides offer thrills and excitement for children and adults, plus there are additional shows and performances, craft demonstrations by local artisans, and special activities like the VIP tour and SkyZip where you’ll soar over the theme park on a zipline for a panoramic view. For more information about the festival dates, performers, concert schedule, and tickets, visit Dollywood Barbeque & Bluegrass Festival page.